Departing orthodoxy? : Retired Bishop John Shelby Spong (foreground) leaves a Good Friday service at Richmond’s St. Paul’s Episcopal Church followed by Rev. Wallace Adams-Riley and Bishop Shannon Johnston (back). Follow Jeff Walton on Twitter. Less than a month after sponsoring an event for Virginia Episcopal clergy featuring a speaker who denies both the afterlife and unique divinity of Christ, Bishop Shannon Johnston of the Episcopal Diocese of Virginia has presided over a service featuring a similarly controversial figure. 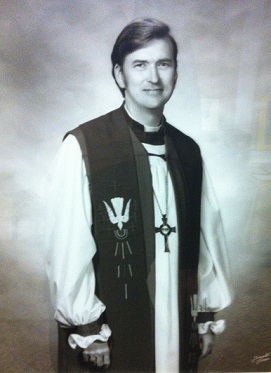 In a Good Friday service at historic St. Paul’s Episcopal Church in Richmond, retired Bishop John Shelby Spong decried the Nicene Creed as “a radical distortion of the Gospel of John,” asserted that several of the apostles were “mythological” and declared that Jesus Christ did not die to redeem humanity from its sins. 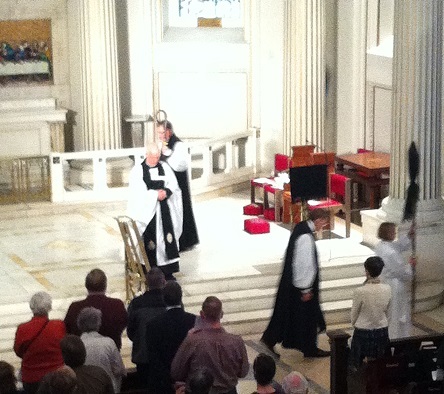 The three hour service featured a series of six meditations by the retired Newark bishop interspersed with prayers led by Johnston and a hymn promoted by the Center for Progressive Christianity entitled “Welcome doubt: Refine our thinking.” Johnston’s promotion of Spong, whose Newark diocese famously declined by 40 percent during his tenure, further undercuts the Virginia bishop’s claim to be creedal and orthodox. Spong has a long history with St. Paul’s, serving as rector of the onetime “Cathedral of the Confederacy” from 1969 to 1976, before his election as bishop of Newark. The Greek revival church across from the Virginia State Capitol, which once counted Robert E. Lee and Jefferson Davis among its worshippers, continues to draw prominent Richmond-area figures including a former Virginia governor and first lady who offered scripture readings on Friday. Arguing that the Gospels were not historic accounts of the life and ministry of Jesus Christ, Spong sought to isolate the fourth gospel, insisting it was not authored by John the son of Zebedee. Instead, the retired Episcopal bishop proposed that the Gospel of John was not a story of incarnation. “This Gospel sees Jesus as a life lived so deeply that he reached mystical oneness with God,” proposed the author of the upcoming book “The Fourth Gospel: Tales of a Jewish Mystic”. Seeds of doubt: Spong as rector of St. Paul’s in the 60s and 70s. Much of Spong’s material centered on an assertion that the gospel of John could not be read both literally and accurately. Spong also declared that the gospel’s portrayal of “the beloved disciple” was never intended by the author to be viewed as a person of history, rather to illustrate symbolism of one whose eyes have been opened. “The beloved disciple is simply the last in a series of literary characters created by the author to tell a story,” Spong announced, pairing it with Mary’s presence at the crucifixion, which he asserted was a late addition. “We are not sinners, the church got that wrong, we are rather incomplete human beings,” Spong concluded with an “amen” that was echoed by the congregation and clergy present. We have a specific and highly accurate term for people who hold the views of Spong: Non-Christian. But hey, he does wear a collar, so I suppose I could be wrong. I’ll be sure to tell all the fundamentalists I know that, according to the bishop, John was directed against them. What an insight. Can’t imagine why his diocese declined. With progressive “Christians” like Spong distorting scripture to suit themselves, is it any wonder that atheist and “none” ranks are growing? Who wants anything to do with this incoherent blather? John Spong reminds me of a kid named Lee in my sixth grade class. He couldn’t get people’s attention by being exceptional, so he did it by passing gas. How much character does it take to proclaim disbelief? How much arrogance does it take to presume one has Gnostlike knowledge that labels all of traditional Christianity wrong? LIberal doubletalk–ecclesiobabble–sounds so erudite but is finally so empty. Spong has had his little moment and is passing into oblivion, as the common and ordinary do. Like Lee, after he’s gone he’ll leave little more than an odious memory. Those who are remembered are the great believers: the John Wesleys and E. Stanley Joneses, who championed the great truths of the faith and encouraged others to believe as well. Shame on you, John Spong. Only the Lord knows how many young minds you have harmed. A note to John Spong from Ravi Patel: Say hello to Swami Jesus when you see him.If you didn’t see The Life of Pi you might not get the joke, but seriously it is an interesting Jesus he creates. Well maybe not interesting at all, but what is interesting is why anyone would listen to him. What does Spong ever say that rises above a crude gnosticism? Not much. You’d think in his decades long quest to be cutting edge and socially relevant that he would at least have read some of the gnostics of the early centuries of Christianity. They made better arguments than he does. And yes, of course Spong would disdain the Nicene Creed. Imagine taking John’s teaching in his epistle “…that which we have seen…heard…touched” literally. Why it almost makes you believe that the apostles saw the incarnation, death and resurrection of Jesus Christ as historical space-time events. It’s too bad that John Spong was born too late to attend the Council of Nicea back in 325. He could have revealed to his august peers that the ‘Christ figure’ was actually a crypto-Progressive. Imagine it. The Church could have skipped its two thousand year wandering through the theological wilderness. Constantine could have been persuaded to implement Obamacare. We’d all be in Nirvana by now living happily ever after. As a neo-arian about the only thing the Bishop is reported to say I agree with is “the Nicene Creed as “a radical distortion of the Gospel of John,” It is. But the really sad thing is his denial of the ransom, which is the essential teaching and doctrine of the New Testament and, consequently, Christianity. Just about everywhere one looks in the New Testament one can’t get away from that teaching. So that denial is the real heresy he follows and from which all his other errors flow. One doesn’t need a seminary to prove that heresy wrong, just a decent knowledge of the Bible. But the problem is that when one does not accept the veracity and authority of God’s word no amount of reasoning from it will do any good. So people like him, with their seminary educations and following after ‘theologians” who think of God’s word as just a product of men and their thinking will assert the things they do. In 100 years, Mr Spong will be dead, and his bizarre interpretations will be lost in some corner of the internet. Jesus though will be very much alive, and his ideas about salvation, sacraments and the Church will be also. Was there no one in the building on a Good Friday to get up and walk out? I would like to know why this man goes through with the charade of worshiping using words that express a series of beliefs that he obviously rejects? If he cannot accept the Nicene Creed, why he would want to serve as a Bishop of a Church that still professes belief in the Nicene Creed. Was the pay so good that it was worth the hypocrisy? I would also like to know how the Episcopal Church can call itself Christian if it allows bishops who reject the most basic Christian beliefs? Does it mean anything to be an Episcopalian any more? Is there anything of Christianity, or theism for that matter, that John Shelby Spong hasn’t rejected? He’s denied the Resurrection, the divinity of Christ, the existence of judgment and hell, and he denied God is a “being” or is personal. I may be a fool for believing in Christ, but how foolish is it to go to all this trouble, that he did, to mark Good Friday when you don’t believe any of it? By response to liberals who claim there is no hell and no Last Judgment: Stand by for an update. I know we are warned of these times in the Holy Word of God but I still find it so hard to believe that not a one…no, not even one, got up and walked out. Yes, stand by for Judgment Update. Why the Episcopal Church would ordain someone who obviously doesn’t believe in the Bible as the Word of God, let alone the historic creeds of Christendom, is beyond me. Oh wait. I take that back. After the sermon Luis Leon gave on Easter Sunday, I definitely am not surprised they ordained Spong! Would you invite Shelby Spong to preach on Good Friday in your church? I certainly wouldn’t. But someone at Saint Paul’s Episcopal Church in Richmond, VA thought it a pretty good idea. Liberals always say they aren’t big on dogma, but it isn’t so. Spong and his tribe are committed to the dogma that any tilt leftward is inevitably a good thing, that holding on to a tradition or trying to turn back the clock is pointless. Change is always good. Who says? God gives us the wisdom to discern that some change is good, some isn’t. What is the point of being “progressive” if you are “progressing” in the wrong direction? We’re supposed to worship God, not trends. Please, outraged Episcopalians, wake up–there’s AC-NA (Anglican Church in North America) growing like the wildfire as the Holy Spirit intends! Corporate prayer, scholarship, terrific preaching, missionary outreach, servanthood, sacramental fealty–put this decrepit husk of a village tea society and its outrageous ‘spokespeople’ like Spong out of its misery (TEC). It’s easy to know that Jesus did died for my sins. I have primary source material to read from every day, the Bible. He was “slain from the foundation of the world”, he “gave himself for our sins” and is the “propitiation for our sin and for the sin of all the world”. I believe both Ezekiel and Paul when they said the soul that sins dies, and the wages of sin is death. That death was done by Jesus for me and for Mr. Spong. Why doesn’t Mr. Spong want to believe what the Bible teaches? It is good for his instruction, for correcting him, and it’s profitable for him. Example: I did not become fully human until I was given to know that I am a sinner and Jesus’ shed blood has relieved me of the eternal death I brought on myself. I know and experience “wholeness” because of this. This is very elementary reading of the Bible. Except we become as believing children, we shall not see the kingdom of God. And this simplicity is what saves us. Thank God he inspired his word to be understood without having to have college training to grasp it, or as Jesus would say, he thanked God that he revealed himself to babes and kept his revelation from the wise and prudent. I wonder if Mr. Spong ever asked himself who these wise and prudent are? Praise the Lord for his word. It shall stand forever. My suggestion to Mr. Spong: read and start believing what you read. It will give you understanding you never could imagine, even in your best days at seminary. You do not have primary source material unless you have discovered one of Paul’s epistles in his own handwriting. The Gospels were written many decades after the death of Christ. None of this is too surprising, because St. Paul’s Richmond is like so many “historical” churches, it’s a gathering of the artsy-f***sy culture vulture types. I knew an elderly couple who had attended St. Paul’s for years, for them it was a pleasant little social club, “nice” people, upscale but not filthy rich, nice music, stained glass. They didn’t describe themselves as either “spiritual” or “religious,” and they chose to overlook all the politicking from the denomination (but silence gives consent, right?) So, for those of you who wondered why people at St. Paul’s didn’t raise a fuss about Spong’s heretical ramblings, the answer is, most people in that kind of church don’t care one way or the other about doctrine and don’t lose any sleep over whether their little social club is “orthodox.” Combine the lefty political types like Spong with the spiritually indifferent culture churchgoers, and that’s your Episcopal church of today. Alas.